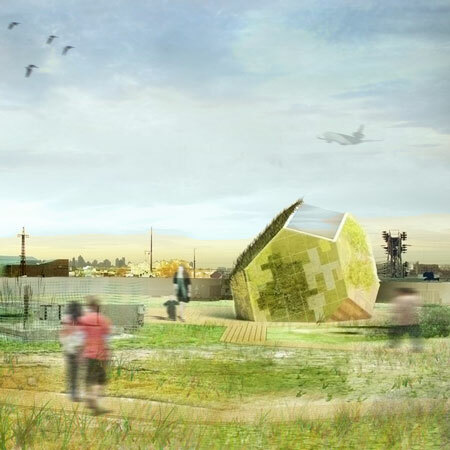 Brooklyn architects Solid Objectives - Idenburg Liu (SO-IL) have designed a rooftop landscape of allotments to showcase green roof technologies on an industrial building in Queens, New York City. The project has been commissioned by Garden City Roofs, a company that specialises in green roof systems. "As a result of [Mayor] Bloomberg’s PlaNYC, in which he call for buildings to be more energy efficient by 2030, interest in green roofs is on the rise," says Florian Idenburg of SO-IL. "Our client is a start-up company who is catering to this new interest, mostly by inexperienced building owners. "She is providing a one-stop-shop, where one can learn about the roughly half a dozen systems available, get structural engineering advices, tax rebate advice, installer and maintenance recommendation. "We have designed the allotments; and a small sales offices, that doubles as a display for “green” materials for which our client is a rep as well." Roofs are underused in New York City. Garden City Roofs, a startup company headed by Beth Lieberman, caters to a growing need for technical expertise and access to green roof systems. Garden City Roofs is converting the unused roof of a large industrial building into a showroom and knowledge-center for green roof systems. SO-IL has been asked to evaluate access, layout the roof systems and hard-scapes and design a sales- and learning center on the roof. The factory building, where once typewriter ribbons were made and which now houses a gym and billiards hall, is located along the train tracks in Sunnyside Gardens, Queens, opposite of the New York / Korean Presbyterian Church by Gregg Lynn. Sunnyside (above) is known for one of America’s first planned communities, Sunnyside Gardens. Constructed from 1924 to 1929, this residential area has brick row houses of two and a half stories, with front and rear gardens and a landscaped central court shared by all. This model, based on Ebenezer Howards garden city principles, allowed for denser residential development, while also providing ample open/green-space amenities. In this spirit, and that of one time resident Lewis Mumford’s ideas of the organic city, the project is conceived as an integral part of the natural roofscape. The idea is to create an atmosphere as if working under a tree with little division between in- and outside. The pavilions form is achieved by slicing and rotating a Truncaded Octahedron, one of the most beautiful Archimedean Solids. The structure will be a showcase of materials that are either completely biodegradable or recyclable. Climate control will be created with natural elements; rain water, sunshine and shading through trees and plants. Above: the industrial building sits along the train tracks, just north of the historic district of Sunnyside Gardens. Above: once typewriter ribbons were manufactured in this building, now it houses a billiards hall and gym. Above: the 21000 sf underused roof is a vast landscape of covered skylights and mechanical equipment. The idea is to create an atmosphere as if working under a tree with little division between in- and outside. Above: a 200 sf pavilion sits between the gardens, for information and display of materials. The allotments for the different roof-systems on display can be reached by a pathway connecting entrance, allotments and a deck which is used for educational purposes. Above: a map of the different materials on display on the unfolded truncated octahedron. Above: natural light comes in through a sole window. Above: the building is well visible when landing on La Quardia Airport. The allotments form a recognizable pattern from the air. Program: Entrance, office, hard-scape Area: Exterior: 21.000 sf; Interior: 200 sf. Note: To be completed spring 2009.